Advantage Basketball Camp's approach to our basketball shooting camp is essentially the same as our world-renowned approach to teaching ball handling. Advantage Basketball Camp teaches the camper to perfect their shot through intense, repetitive drills that lock the necessary shooting technique into the camper's muscle memory. This will enable the athlete to execute proper fundamentally-sound shooting mechanics. This is accomplished by breaking the shot down into several stages, and then making sure the shooter fully understands and learns each step. This process is a lot of hard work with great attention to detail, that will produce unbelievable results. If you are willing to do the work, then Advantage Basketball Camp's Shooting Camps will dramatically improve your shooting percentages. After a quick overview, we begin by focusing on the shooters' balance and footwork. Improper footwork causes improper balance. Bad balance for most players is as responsible for a low shooting percentage as bad form or poor shot selection. Before we move on to the shot itself, the campers will have a very thorough understanding of balance and the importance it plays in the execution of a proper shot. For our more experienced campers, we will get into which footwork to use in relation to where they are on the basketball court and in relation to their defender. For example, if they are coming off a "pick" east to west or west to east, they can create space with a pull-back move and then take a shot. We also cover topics like shooting off the dribble, quick release of a pass as the defender slips under the pick, and stepping into a jump shot. All these situations and techniques require proper footwork to achieve proper balance. Obtaining a good center of gravity is critical to the shooter and again is achieved with proper foot work. This is obtained when the feet are properly placed, the shoulders are square to the basket, and the shooter's body is in proper relation to placement of their feet. This, like all other areas of the player's game, has to happen instantaneously. The athlete does not have the time to pre-think and sort all of this out during live game play. If all of this different footwork is firmly locked into the athlete's muscle memory (like playing the piano), their mind and body will instantaneously work together to execute whatever footwork is necessary to obtain a good center of gravity and proper balance to execute whichever shot they choose. As always there is only one way to get all this information locked into the athlete's muscle memory, and that is with repetition. The camper must drill over and over until enough repetitions have been executed to firmly lock the skill into the their muscle memory. Shooting pocket/alignment: Shooting pocket is the point from where a shot is started. The player's shooting pocket will vary depending on their age, skill level, and strength. It is very common for coaches and parents to try to move the athlete's shooting pocket up too high before the shooter is ready. Alignment may very well be the single most important part of the shot. Assuming our shooter has established a good center of gravity, their hand, and most importantly, their elbow, must be aligned with their shoulder, which must be square to the basket. With our younger athletes, especially younger female athletes, they tend to lack the necessary upper body strength to keep the elbow properly aligned on outside shots. However, they can have proper alignment when working on their form and while "form shooting". Release point: The release point is that point at which the shooter releases the ball. An improper release point is one of the reasons the ball will have little to no rotation. A shooter can have decent follow through, hence good rotation, but still have a bad release point. A bad release point is prevalent among most young players. It is commonly referred to as "pushing the basketball". Pushing the ball will cause a low-angle, flat flightline path to the basket, thus greatly reducing the chances of the basketball going through the hoop. It is a simple matter of geometry. It again should be noted here that for our more advanced players, their release point will vary depending on how quickly their defender is closing out on them. We will work on quick-release shooting with these advanced players. This is not taught to most young athletes. As a rule, the higher the release point the better. A high release point will eliminate pushing the ball, will give you great rotation, and cause the ball to approach the basket from a great angle thus dramatically increasing your shooting percentage. It should be noted here that a high release point for younger players can only be achieved within their shooting range (close to the basket). You can increase this range by adding more leg to the shot. Follow through: follow through is sometimes referred to as "touch" or "shooter's touch". Great follow through is what will cause the ball to have great rotation. Proper rotation is what will cause the basketball (providing the ball has not been pushed and is dropping from a proper angle) to grab the backboard or rim and drop through the hoop rather than bounce out. Advantage Basketball Camps' Shooting Camp uses many drills to work on each of these areas of the player's shot. All shooters, regardless of where they are in their skill development, can and will benefit from each of these drills. How much time each camper will spend on a certain drill will depend on which part of their shot needs the most correction. There is truly only one way to lock all this into our shooters muscle memory and that is to drill and drill. Long, hard, boring, hours of repetitive drills. Of course, it really does help to have someone who can break the shot process down and show the shooter the right drills to use. Some camps would simply have the campers push the ball up at the basket for 8 hours. While this approach will produce a better shooter than staying home and watching television, it does nothing to educate the player or fix the areas of the their shot that needs to be corrected. While Advantage Basketball Camps' Shooting Camp is a lot of hard work, we do produce great results. Let's take a look at some common problems that you can spot in your young athletes shooting techniques and what causes them. a. Incorrect feet placement and an incorrect center of gravity. b. The guide hand was improperly placed, interfering with the shot on the release. c. Poor shooting-hand placement which interfered with the shot. This is commonly referred to as "thumbing the ball". a. No follow through. The shooter did not snap their wrist at the apex of their shot. This is usually caused by a bad release point, which is generally caused by pushing the ball. They are usually, but not always interconnected, but usually are. b. "Pushing the ball". This is very common and is very prevalent in new campers. Changing this one bad habit will dramatically improve an athlete's shooting percentage. Flat shot: The shot takes a low-angle path to the basket, rather than a high arc which provides a larger target. (See diagram below.) This is caused from pushing the ball, which is often the result of the shooter being outside their shooting range or they have a bad release point. They may lack the upper body strength or skills to shoot from a longer distance. Also refer to shooting range. a. Shoulders are not square to the basket. c. Feet are planted too close together when moving east to west or west to east, resulting in unstable balance. In this situation, the player is essentially falling in the same direction they are moving when they decide to pull up and shoot. d. Elbow out instead of aligned. e. Positioning the ball in front of the face, thus creating bad alignment. f. Fingers on the shooting hand are positioned too close together on the ball. g. The shooting hand is improperly placed on the ball. h. Feet are not pointing at the basket. i. Moving the head to the side, caused by bad alignment. a. Shooting from beyond a player's range. b. Falling backward while making the shot. c. Shooting while the weight is over the heels, rather than the balls of the feet up through the toe. A very common balance problem. b. Shooting from beyond a player's range. The point here is that tracking the shooter's missed shots will reveal the skills or techniques the shooter needs to focus on in order to fix the problem. "Tracking shots" is a technique used by Advantage Basketball Camps to pinpoint what a shooter needs to work on. Problems with a player's shot are instantly and easily spotted by a trained eye. It is helpful for the shooter to see where their shot is consistently missing in relation to the basket. It is only after they put in the hours of hard work necessary to fix the problem, and their shooting percentage has increased, that they are ready to listen to the coach and do more of the necessary work to correct other problem areas of their shot. To track a player's shots, start by drawing 100 circles on a piece of paper. Every time the player takes a shot, place a mark on the the circle indicating where the ball hit or missed the rim. For example, if the shot misses to the left of the rim, put a dot on the outside left of the circle. If the shot is good, but it is off-center to the front, place a dot on the inside front edge of the circle. If the ball swishes and doesn't hit the rim at all, put a dot in the center of the circle. For more advanced players and shooters, the tracking system includes a lot more information. Where the shot was taken from on the floor? Was the player moving from left to right or right to left? Was the player set, or was it a jump shot? Was the shot a "runner' or "floater"? Was the shot taken with the left hand or right hand? The list depends on which player is being tracking and at what level. Our shooting diagram shows the angle at which the basketball approaches the basket. When the ball approaches the rim from a 30 degree angle of inclination, this is called a "flat shot" or a "rope shot". It is a very low-percentage shot. It is possible for a shot to go in from this angle, but it must hit the basket perfectly. Most younger players shoot flat shots. It takes less power to get the ball to the hoop, and therefore the player can shoot from further away, but will dramatically decreases their shooting percentage. The ball coming at a 30 degree angle only gives the ball 9 inches of the available 18 inches for the ball to go through the hoop. Refer to the diagram and notice how narrow the rim appears to the ball. With a flat shot you are not using the available rim and your shot must be perfect. From a 50 degree angle, the shot has 16 inches of available rim space for the ball to go into the basket. From this angle you can be off as much 3 inches in either direction and still have the ball go into the basket. At a 70 degree angle, there is a little more than 17 inches of rim space for the basketball to go through the hoop. Shooting percentages will dramatically improve for shots made at this angle compared to shots made at lower angles. So far, we've focused on basketball shooting techniques and tips. Another important skill taught to students at Advantage Basketball Camps' Shooting Camp is how shooting from different locations on the court will increase their shooting percentages. This is often referred to as "shooting range". Once a player gets outside their shooting range, they must lower their release point, push the ball and, therefore, dramatically decrease their shooting percentage. Tracking shots can really help a player and coach increase a shooter's success. For more advanced players, several variables are tracked: angles to the basket, defenders, left to right or right left movement, type of shot, "power foot", and so on. For most younger players, the rule or lesson is simple: the closer to the basket, the better the shooting percentage is going to be. Player A puts up 23 shots in the championship game on Sunday and makes 6 of them, including two three-pointers for a total of 14 points. Player B shoots 8 shots and makes 5 of them for a total of 10 points. Players B and C put up a total of 12 shots for a total of 16 points. Player A was the leading scorer but took 23 shots to accomplish this. If player A could take 23 shots and hit 17 of them, then have at it. But Player A, while consistently being the team's leading scorer, is actually hurting the team by taking low-percentage shots. If Player A would take fewer bad shots and give the other, smarter players more shots, the team's shooting percentage would go up and the team would win more games. While many fans and coaches at the lower levels of the game are very happy with their leading scorer, great coaches and scouts at the upper levels will pass on the 18-points-per-game player who is shooting in the 23-percent scoring range. They will instead opt to recruit the 10-point-per-game player who is shooting in a 58-percent scoring range. 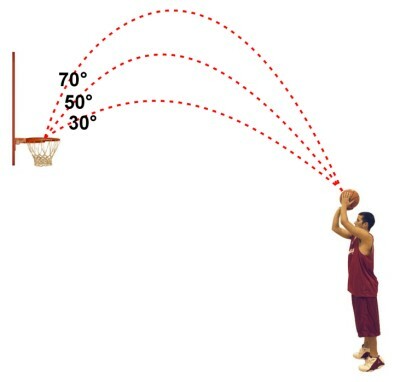 Shooting range, simply put, is the distance or range from the basket where the player can shoot the basketball with good form and make a high percentage of their shots. To increase their shooting percentage, advanced players need to gain an understanding of which shot to use and where that shot should be used on the court and in relation to the position of their defender. When a player has moved far enough from the basket that they start pushing the ball to get the ball to the basket, they have moved outside their shooting range. Once a player is outside his or her shooting range their shooting percentage will drop off dramatically. Our first goal is to learn to shoot the basketball with picture-perfect shooting form. This can be achieved with the right training and hard work. We hope to see you at an Advantage Basketball Camps' Shooting Camp. Come prepared to work hard and take notes. The training will be some of the best you have ever had. Learn more about the Advantage Basketball Camps teaching methods. Meet the Advantage Basketball Camps coaching staff. 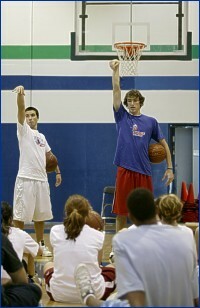 View a schedule of Shooting Camps. Register for a Shooting camp now!